Although pitbulls originally gained popularity because of the ferocious nature and were used in the sport of baiting, these dogs are not always aggressive. Some people think that pit bulls dogs can attack their own owners and are not to be trusted. This is a complete myth and although pitbulls can be an aggressive when provoked, when trained properly pit bulls are well behaved and rarely attack other humans. Bite force is measured in terms of pressure PSI (per square inch). Because of the origin of pitbulls, people expect them to be more ferocious and have a bite force stronger than other dogs. This has been proven to be a complete myth. Data reveals that there are other dogs that have a much higher bite force and compared to that, pitbulls are considered much gentler. Many of these myths developed during the time when pitbulls were used in sports like baiting and owners needed to encourage such bloody sports. Though baiting was ultimately banned, this misconception stuck for years after. The truth is that pitbulls have an extraordinarily volatile temper and only react when provoked, just like other dogs. Also, There s that there s no evidence that they feel no or less pain and it is high time that people stop believing in these false notions. Another common misconception about pit bulls is that this breed has lockjaws and it is difficult to open the jaws once these dogs lock in a bite. The truth, as revealed by numerous studies on the bone structure of pit bulls, is that this breed has a structure not very different from other dogs and “locking jaws” is just a myth that people have about this breed. On the contrary, pitbulls are excellent with children and good play companions for them. However, dog owners also need to know that pitbulls have to be trained to interact socially so that they do not embarrass you in front of friends and family. Everyone and anyone can own pitbull. These loyal companions are excellent house pets, provided it gets the right training and exposure. 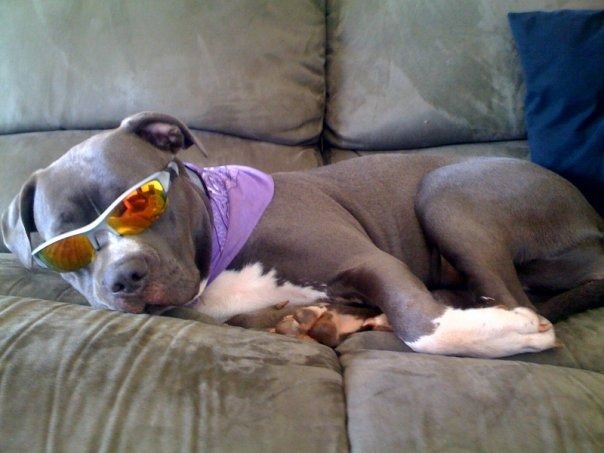 Do not be afraid to take your pit bull to your friend’s place or hesitate to invite people at your place. Interaction with other humans is important so that its social skills can be honed and it does not aggressively react to new people. In fact, if trained a pitbull can also live peacefully with other pets. The truth is far from this misconception. In fact, experts advise that owners train their pitbulls from a young age. This is highly trainable and used in search operations, therapy and enrolled in shows to exhibit their skill in weight training, agility and other traits. Pitbull owners can engage professionals to train their pets at a young age so that they avoid housebreaking and other destructive habits that puppies have at that age or they can easy learn how to train a pit bull with a Trainings guide. Do you know more myths about pit bulls? Tell us write a comment!